The Marple Website is a teenager! With The Marple Website's thirteenth birthday passing in October it must now be one of the longest running and most active and well supported Community sites on the web! 2011 began with a major upgrade and overhaul of the Friends of Marple Memorial Park web site, which promotes the activities of this local community group that I'm heavily involved with. It's been a very busy year for the Friends of the Park with successful campaigns to save the flowerbeds in the park and to stop the park toilets from being closed. Both have received huge support from the local community and we would like to thank everyone for this. The group have also started work on new projects to extend and upgrade the skate park, to improve the park entrance, to refurbish or replace all of the park benches and, most recently, a new flowerbed project in partnership with Cheadle and Marple Sixth Form College Horticultural Department to commemorate the Queen's Diamond Jubilee next year. More about these last three projects will hopefully appear on the Friends' site over the Christmas holidays. The Marple Website donates £1,000 to Friends of Memorial Park! Before moving on from Friends of the Park activities, I would like to announce that The Marple Website has donated £1,000 to the group this Christmas. This is intended to help with the new Diamond Jubilee Project and primarily represents the year-to-date income from the advertising banners featured on the Marple Website and the Virtual History Tour. Although I can't promise to do this every year (especially if I manage to give up the day job) I will certainly be pledging the income from the banners for the rest of the financial year to the same cause. So a big thank you to all the local businesses who help to support the site by renting the banner adverts and taking out business card pages - it's a fantastic way to promote your business and support your local community at the same time. Banners are only available to local Stockport based businesses and there are discounts for Marple Business Forum members too. So if you are interested in promoting your business on the site have a look here, and get in touch. Marple Business Forum web site is back in business! After creating the very first web site for the Marple Business Forum in 2005, I was pleased to be asked this year to create their new third generation site and rebuild the strong links that the forum previously had with The Marple Website too. The heart of the new Forum site is the searchable directory of more than 150 local businesses and this makes membership great value and is something I'd recommend to all local businesses who want to engage with the local community. 1.2 Million image views on the Marple Website Virtual History Tour! 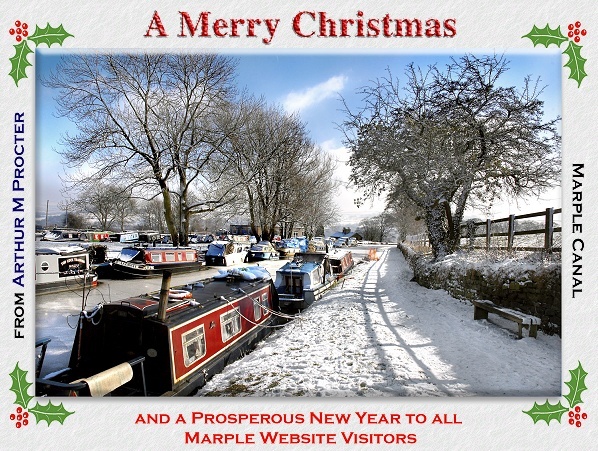 The fantastic milestone of 1,000,000 images viewed on the Marple Website Virtual History Tour was achieved in May 2011 and with the counter now at 1,221,662, this year has been the busiest to date with 326,169 image views since last Christmas. This is 30% up on 2010 and is largely due to the ongoing support of Marple Local History Society, who continue to share their photographic archives with the community through the site, and Arthur Procter, who somehow manages to be at just about every local event the community holds including Marple Carnival, Marple Locks Festival, Marple Festival and Marple Christmas Celebrations! Nearly 1,400 new images have been added to the Virtual Tour this year. As well as thanks that are due to the History Society and Arthur, a good number of images have been provided by other individuals too and my thanks go to everyone who has made a contribution to the growing collection. Please do keep sending your local photos in, old and new, throughout 2012. Something rather special that also emerged from Marple Local History Society's archives this year was a number of VHS video tapes of local people talking about their memories of Marple and the surrounding areas that were recorded by the late Gordon Mills between 1996 and 2004. I was delighted to be able to convert videos of Tom Oldham, Barbara Hambleton, Fred Winterbottom and Trixie Gough to a format that allowed them to be shared with everyone on the Virtual Tour. These are all on-line now and although (as far as I know) there are no others of people talking like this, there are a couple of video treats still to come in 2012! As well as the videos there have been a couple of new additions to the History and Heritage section of the site including a History of Rose Hill Station by Friends of Rose Hill Station and part 1 of Alan Proctor's Recollections of Hawk Green. As always, contributions to this section of the web site are most welcome as they are enjoyed by many visitors. An important area of the The Marple Website is the Community Pages, which enables local groups, with or without their own web sites, to promote themselves to a larger audience. This year new members to "sign up" are The Charles Ingham Bandroom Fund, Marple and District Probus Club, Marple, Marple Bridge and Mellor Energy Saving Strategy and Marple Allotment Association. When kept up-to-date the Community Pages also provide fresh content to keep visitors coming back, so it works well for everyone. I'd particularly like to thank Marple Writers' Workshop, who continued to update their poems and short stories on the site; the Society of Marple Artists, Marple Rambling Club, Marple Arts Group, Friends of Rose Hill Station, The Macnair Trust, Marple Philatelic Society, Marple Wine Club, Marple 10k Trail Run, The Marple Writing Competition and New Mills, Marple and District Rotary Club who all kept their pages (or sites) up to date and current. One of the highest profile groups to join this community in 2011 was Marple in Action, formed this year to oppose the potential development of a supermarket on the Hibbert Lane site of Cheadle and Marple Sixth Form College. The supermarket has been the hottest topic of debate on the forum and notice board since the summer and no doubt will continue to be in 2012 too. However, as it's currently a banned topic to give everyone a chance to be friendly for the Christmas Holidays I'll say no more here! New groups are always welcome to join the Community Pages. All you have to do is provide some words and pictures to get started - it couldn't be easier, so make the effort now! Local people making a contribution! The Marple Website is all about the local community making contributions and keeping the site fresh, active and alive. There are many ways that people can do this, including registering in the forum and posting your two-penneth in the variety of topics discussed there, or publicising your organisation's activities in the Events Calendar. You can also register as a user on the Virtual Tour, which will allow you to make comments on the thousands of photos available on-line (find out about the global password here). You can even advise about changes at your local so that the Pub Guide can be updated. This year I was relieved to start sharing the load of looking after the busy forum with new Moderators Lisa Oldham and Howard Roberts. I'm very grateful to Lisa and Howard for helping out and I'd like to extent my thanks to them both and to everyone else who supports the web site and keeps on coming back - that's what it's all about after all.